I had a bit of spare time today and got my act together enough to make my first card for 2016, based on the layout for the CAS(E) this Sketch #161 challenge. The larger balloons (or thought bubbles, or whatever they are!) are from the Simon Says Stamp Scribble Flowers set, stamped in Versamark ink and then white heat embossed, with SSS Willow, Catkin and Hot Mama inks blended over the top before trimming to size (I’d seen an infinitely more sophisticated use of this technique on a beautiful card by Laura Bassen over at the Simon Says Stamp blog recently and simply had to try it out). The sentiment is Sketchbook Imagine from Memory Box. After completing the main panel I thought it lacked impact, so I added a strip of cardstock coloured with SSS Hot Mama ink on the left, and drew scribbly lines in white gel pen down one edge to tie in with the balloons/bubbles. I think I like that better, more so in real life than in the photos… what do you think? This is fabulous! I love how you’ve colored those scribbled circles. Oh, this is so fun and eye-catching! Wonderful take on the sketch! 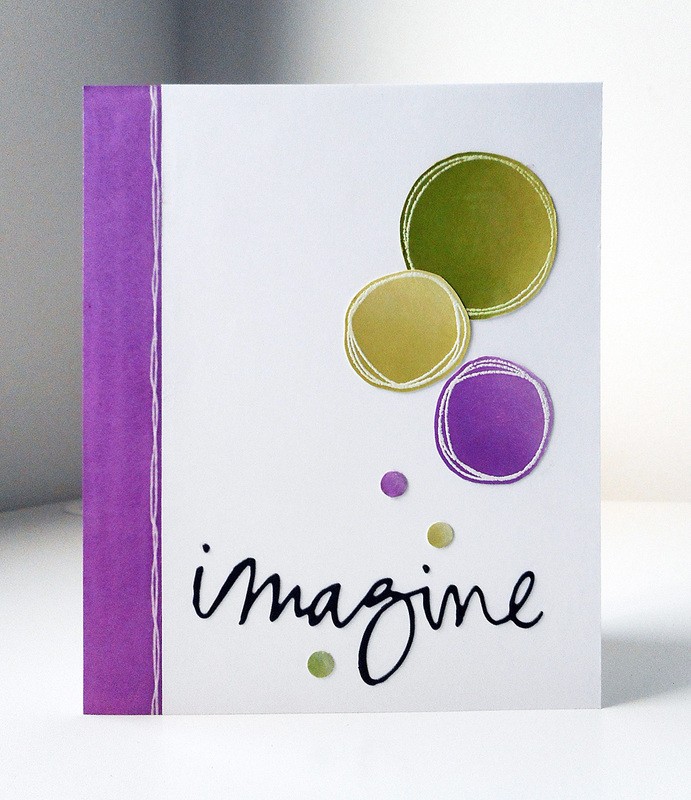 Fun take on the sketch–love the color combo, too! Previous Previous post: Flying saucers, anyone?